SharePoint 2019 is the latest OnPremise version of SharePoint. SharePoint 2019 is built on foundational release of SharePoint 2016. This means there are no huge architectural changes in SharePoint 2019 than its predecessor version - SharePoint 2019. However from the end user perspective the experience has been changed a lot. SharePoint 2019 has been updated to new modern experience. SharePoint 2019 is the latest OnPremise version of SharePoint. SharePoint 2019 is built on the foundational release of SharePoint 2016. This means there are no huge architectural changes in SharePoint 2019 than its predecessor version - SharePoint 2019. However, from the end user perspective, the experience has been changed a lot. SharePoint 2019 has been updated to new modern experience. 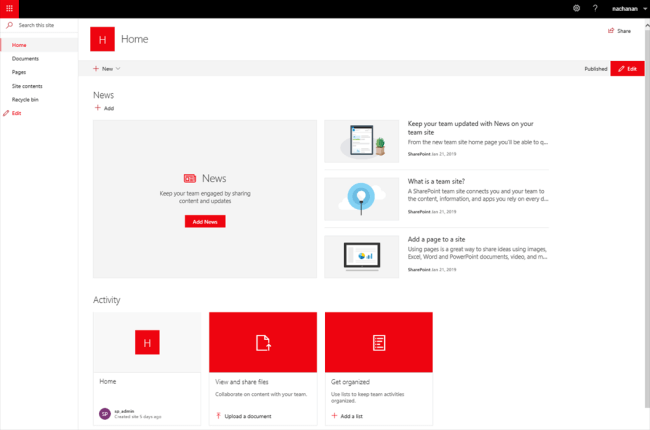 The modern experience is not something new to the cloud (SharePoint online) users, but the same can now be experienced in SharePoint OnPremise. In this article, we will explore the user experience in SharePoint 2019 and compare it with classic or SharePoint 2016 experience. The user experience starts right from the creation of the site, to browsing and managing the content. 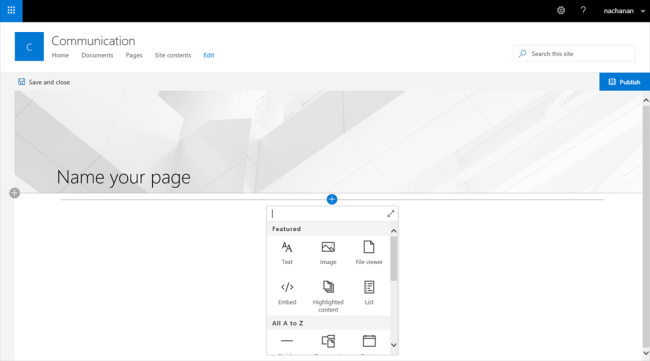 SharePoint 2019 supports the creation of both, classic and modern, SharePoint sites. Below is the site template selection dialog of SharePoint 2019. All of the classic site templates are available along with new modern site templates. This provision can definitely help to migrate to SharePoint 2019 in classic experience quickly and then gradually upgrade to modern experience. The modern user experience is responsive, fascinating, flexible and easy to use. If you are already using SharePoint Online version then you will observe that, SharePoint 2019 user experience is modern but not in all sense as in SharePoint online. Several features of SharePoint 2019 are modern but not all features are modern yet. Let us explore the supported modern experience in SharePoint 2019. The lists and libraries have optimized user experience. The ribbons are now replaced by the command bar instead. Below are a few noticeable enhancements. The command bar supports copy and moving of files. Files can be pinned at the top. Filtering has a new experience. View can be changed inline without going to list settings page explicitly. Columns can be rearranged, grouped and filtered inline. Formatting to the column can be applied inline. Columns can be added to list directly. Modern team site helps to create news, show all news at one place, and display the site activities. Modern team sites are optimized for mobile experience. Modern team site supports faster provisioning than classic team site. The Modern communication site template is available under the Publishing category. Communication site helps to share news, events and other information. Communication site does not rely on publishing infrastructure. Modern pages are fast and responsive. Modern pages are less structured. The edit experience helps to modify the section layout, edit existing sections and add web parts to a page without any server post backs. Modern page does not have any static layout as like classic page. The modern pages have flexible layout and it can be changed at any time. Modern pages does not have any equivalent of wiki page from classic SharePoint. 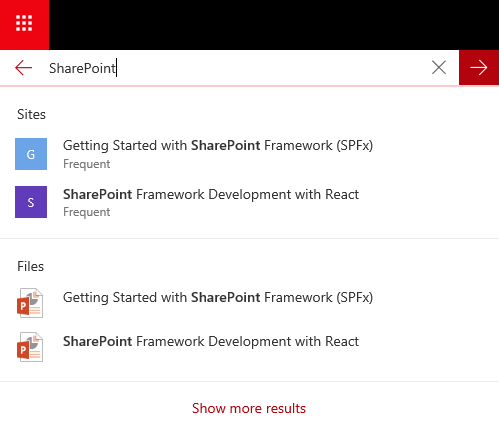 SharePoint 2019 supports modern search experience. The search results are shown as you type the search keyword. SharePoint Server 2019 brings in the modern experience to on-premise users. 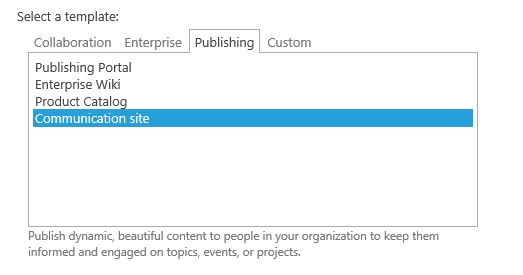 It supports the creation of both classic and modern, SharePoint sites. SharePoint 2019 does not bring in all modern experience as available in SharePoint online. 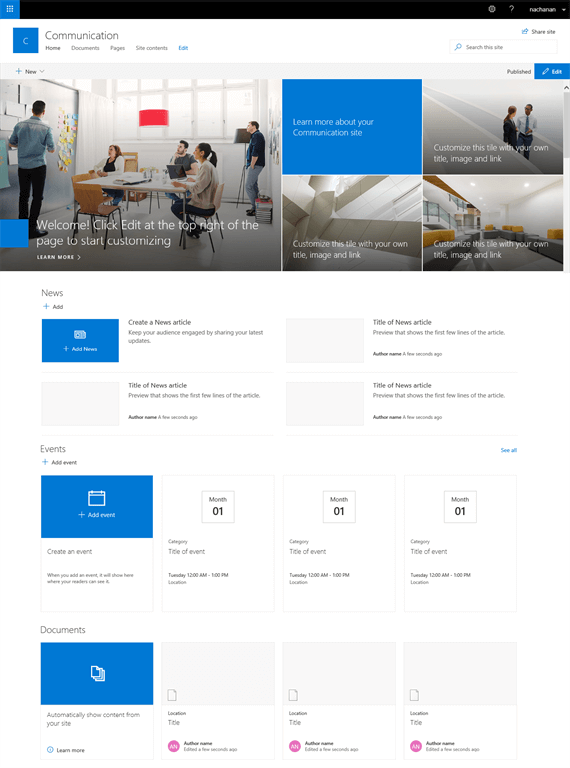 SharePoint 2019 modern user experience is responsive, flexible and easy to use.